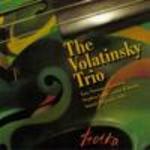 Troika / The Volatinsky Trio. Troika : for pitched percussion or cimbalom, guitar and cello / Stephen Lalor. Instrumentation: Pitched percussion (xylophone/marimba/vibraphone) or cimbalom, guitar, cello. Difficulty: Medium — AMEB Grade 5/6 up. 5 Jun 2016: at Plektra Mandolin Ensemble (Blessed Sacrament Church). Featuring Plektra Mandolin Ensemble. 21 Jun 2015: at Volatinsky Trio in Concert (Camelot (Marrickville)). Featuring Volatinsky Trio. 16 Mar 2014: at Plektra Mandolin Ensemble (Blessed Sacrament Church). 2 Feb 2013: at Volatinsky Trio in Echo Music Series (Blacktown Arts Centre). Featuring Volatinsky Trio. 2 Nov 2012: at Stephen Lalor & Plektra (St Stephen's Uniting Church (Sydney)). Featuring Plektra Mandolin Ensemble, Stephen Lalor. 21 Sep 2012: at The Volatinsky Trio at Manly (Manly Art Gallery). Featuring Volatinsky Trio. 21 Sep 12: Manly Art Gallery, NSW. Featuring Volatinsky Trio. 14 Jul 2012: at Volatinsky Trio (Boite World Music Cafe). Featuring Lucy Voronov, Anatoli Torjinski, Stephen Lalor. 8 Apr 2012: at Volatinsky Trio @ National Folk Festival (Exhibition Park in Canberra). Featuring Lucy Voronov, Anatoli Torjinski, Stephen Lalor. 7 Apr 2012: at Volatinsky Trio @ National Folk Festival (Exhibition Park in Canberra). Featuring Lucy Voronov, Stephen Lalor, Anatoli Torjinski. 4 Mar 2012: at The Volatinsky Trio (Camelot (Marrickville)). Featuring Stephen Lalor, Lucy Voronov, Anatoli Torjinski. 20 Nov 2011: at The Volatinsky Trio (Camelot (Marrickville)). 29 Apr 2011: at The Volotinsky Trio at Fairbridge Festival (Fairbridge Village). Featuring Volatinsky Trio. 17 Apr 2011: at The Volatinsky Trio plays music by Stephen Lalor (Camelot (Marrickville)). Featuring Volatinsky Trio. 16 Apr 2011: at The Volatinsky Trio plays music by Stephen Lalor (Zenith Theatre Chatswood). Featuring Volatinsky Trio. 5 Feb 2011: at The Volatinsky Trio (Blacktown Arts Centre). Featuring Volatinsky Trio.